Monmouthshire and Brecon Canal CanalDiscover the Brecon Beacons afloat on one of the most scenic canals in the UK. The Monmouthshire & Brecon Canal which runs through the Brecon Beacons National Park, meandering from 35 miles from Brecon to the Pontymoile Basin in South Wales. This quiet waterway, with very few locks is nice and easy for beginners and offers holidaymakers incredible mountain views and some of the darkest night skies in Britain. The canal is also great for canoeing, fishing, walks along the towpath (a section of the Taf Trail follows the canal bank for walkers only), and for canal boat holidays. the full length of the canal towpath is a public footpath.The canal is a favourite location for the kingfisher to breed. During its passage through the National Park it features six locks and several pubs and inns are to be found adjacent to the canal. There is a short tunnel through which the canal passes near Talybont on Usk and visitors often stop to watch novice canal users negotiate their way through. Stone bridges crossing the canal and a common and attractive feature. There have also be few aqueducts one of the finest of which is located 8200 m down stream from the canal lock adjacent to the minor road B4558 at Cefn Brynich (SO 079274). There is an excellent view of this aqueduct from the road bridge at this point. 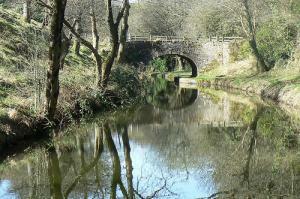 The canal was built between 1797 and 1812 to link Brecon with Newport and the Severn Estuary. Stone and processed lime from nearby quarries was transported by tramway to the canal and then by barge to Newport. At the time of the construction of the canal, roads were horrendously bad and transportation by water was the cheapest and most efficient way to move goods. From Newport the lime would be transported for sale in various markets often overseas. A major tram road link existed between the canal and the large limestone quarries at Trefil and Llangattock. The Llangattock escarpment dominating the skyline near Crickhowell is actually an extensive lime stone quarry which developed as a result of the construction of the canal. Today part of it is designated as a special site of scientific interest and it is the entrance to one of the most challenging cave networks in Britain. The iron works in the Clydach gorge transported its products along a tram road linked to the canal at Gilwern. In the village of Talybont on Usk the ruins of the disused lime kilns serve as a reminder of a time when the canal carried processed lime for household and agricultural use. The canal had fallen into disuse by the 1930s but was gradually restored by the British Waterways Board with support from the National Park and others. The canal was reopened to the public in 1970. Discover the Brecon Beacons afloat on one of the most scenic canals in the UK. The Monmouthshire & Brecon Canal which runs through the Brecon Beacons National Park, meandering from 35 miles from Brecon to the Pontymoile Basin in South Wales. This quiet waterway, with very few locks is nice and easy for beginners and offers holidaymakers incredible mountain views and some of the darkest night skies in Britain.